Using the gui and cli, how can one sign a message with the monero private key? And then how do you verify it with the gui / cli / online js application? If you sign the file yourself you will probably get a different signature than me. This is because the signing is not deterministic. 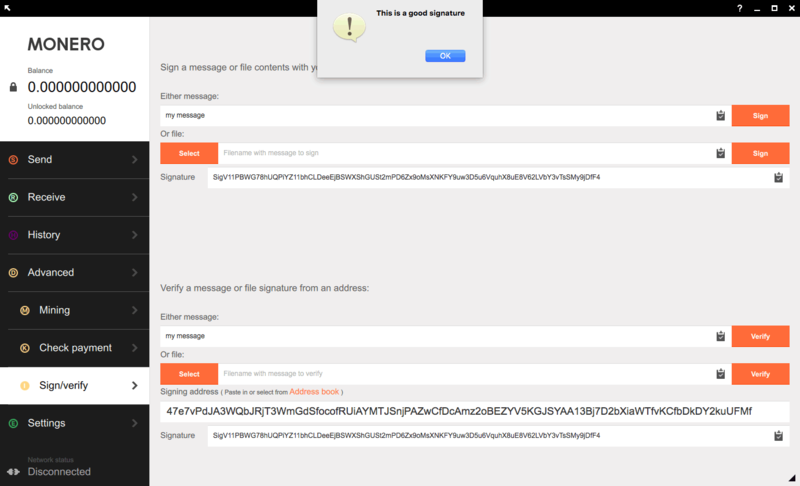 Nevertheless, you should be able to verify my signature without problems. You can also use the official wallet rpc server (monero-wallet-rpc) to sign and verify from another application, using http request. Obviously, you can use this method with any application that supports http requests. Note, signing a text file with the cli, and signing the text using rpc are two different methods, and you can't take signature from one method and verify it using another. This means you should use the same method both for signing and verifying. Using the example seed above, you can also do this in the GUI. Create a new wallet from the example seed above. Navigate to Advanced > Sign/verify tab. Paste the address into "Signing address" field (at the bottom). Write "my message" in the the message field at the top. Copy the message into the verification "message" field. Not the answer you're looking for? Browse other questions tagged monero-wallet-cli messagesigning or ask your own question.